Markus Palttala plays a key role with PSI and the running of its two Corvettes – plus driving one of them – but the Finn earned himself a first drive in the ALMS at Road Atlanta recently, although that meeting didn’t turn out quite as anyone would have liked at Risi Competizione, with the #62 car at least. Palttala is at Le Mans this weekend, for the FFSA GT meeting, and with the DTM cars on the Bugatti Circuit, that was a chance to catch up with everything that has been happening in his world recently. PSI has had considerable success in the FFSA GT Championship this year, notably at Albi in early September, when the two Finns won both races. But besides the Corvettes, we wanted to ask Markus about his drive in the Risi Ferrari. How did that come about? 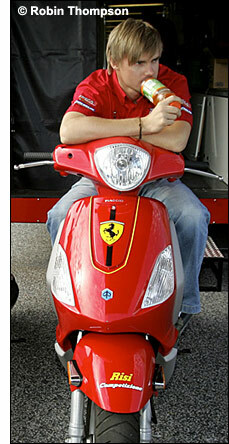 “The contact started with Heikki Kovalainen, who met Mika Salo at the FIA GT race at Silverstone in May. Heikki is a good friend of mine, and he mentioned my name to Mika, who knew all the time that he couldn’t race in all the ALMS and FIA races: I think there were four clashes. “Anyway, my name was ‘on the table’ as a possible replacement, although the Ferrari people didn’t know me well enough. But Mika and his manager convinced them that I was a good guy, and that opened the door – so the Risi Competizione team and Ferrari agreed that I should do Petit Le Mans. “But they wanted me to do the test at Road Atlanta on the Saturday, a week before the race…. which was qualifying day at Jarama. I did the first 10 minutes of the first session in Spain, but that session started while I was supposed to be at the airport in Madrid – so I rushed off and caught the plane to America, and arrived at the track on Saturday morning. “I left there a little early in the afternoon, and arrived at Jraama just as the race was starting – but that was OK, because Jos Menten qualified the Corvette, and started the race. In the end, we changed the strategy and I only did one stint of that race. “The Ferrari is a really well built, sophisticated car – but handling wise it’s very different from the Porsches I’ve driven in the past, and the Corvettes. I needed some time to get used to it, and to learn the track – but it’s a cool car to drive. The team was very good: they didn’t put any pressure on me to go quickly, but I was two-tenths slower than Ralf that day, so I was happy, and they were happy too. 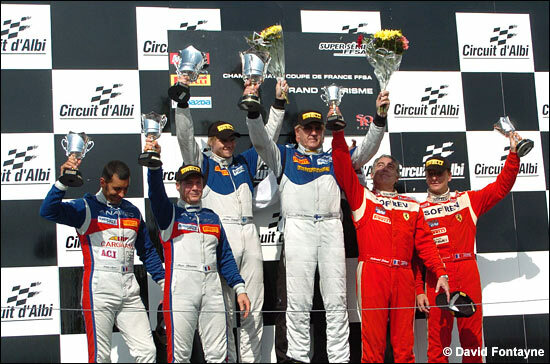 Stephane (Ortelli) didn’t need to be at the test, because he’d won the race at Mosport. “When Stephane and I flew back for testing on Wednesday, the team was happy for me to not take a major role – because basically I was the new guy. I was happy to fit in with whatever they wanted. I drove less than the other two, but that was OK.
“In terms of preparing for the race, maybe we made the car as quick as possible, but overlooked race consistency….” The car was very quick in night practice though (below), as well as in qualifying. Markus Palttala is too much of a gentleman to go into details, but he had considerable sympathy for Ralf Kelleners and the accident that eliminated the Ferrari from the race – which meant that he and Ortelli didn’t get to drive the 430 in the ninth Petit Le Mans. That was disappointing, obviously, but the two drivers set off to enjoy the event anyway. “Stephane and I took two scooters out, and we watched the race from every corner – and we met a lot of fans too. We stood on top of someone’s motorhome at one corner, which was great fun. The American fans all seem to be supporting a driver or a team – the ALMS already seems to have built up a tradition. “Petit Le Mans is a great event, and everything is done for the public, everything is open to them. They can meet the drivers, get close to the cars, they’re wearing team gear, they know the drivers faces and names – it was fantastic. “Le Mans is a big thing, obviously, but I’m not sure that the atmosphere is the same at Jarama, for example. “In Europe, it’s always a problem when the races don’t go to the tracks at the same time each year. But in Belcar, they do have the races at the same circuits, at the same time of year – trying to build a tradition. But at Istanbul, I would say there were less spectators there than there were team personnel. You have to have continuity and marketing, because there are so many other types of racing to attract fans, such as F1, DTM, the WTCC etc. Back to this weekend, and French GTs, and the amiable Finn finished up by explaining where the PSI Experience team has got to, at the end of 2006. 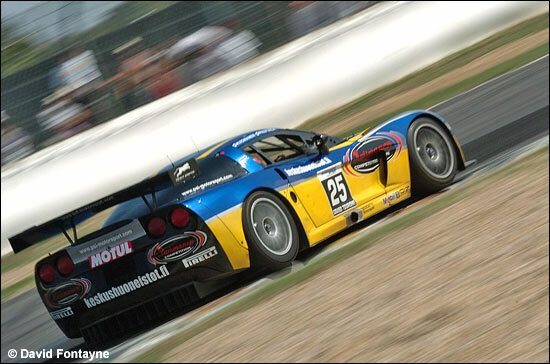 “For 2007, everything is open at the moment: if we are to buy a second C6.R, we need to sell the C5-R – but really that would only be because it is tricky running the two models, which need different components, so that means we need to take two trucks to the races. It’s more an image thing than anything: the C5 is a very good car. So there we are, we’re up to date with Markus Palttala – for now anyway.